Is Vegas the Asphalt Jungle? Thread: Is Vegas the Asphalt Jungle? It's not mine, but saw it recently. Definitely fun to hit nice hands, no matter the game, when starting with garbage. 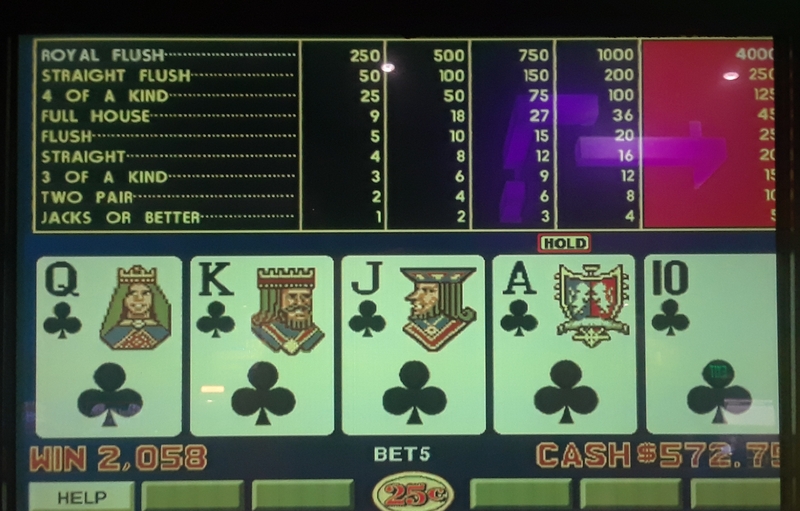 My first quad on Mississippi Stud started with a hand you're supposed to fold. It was a mid card and a low card unsuited. But since I play with "information", I knew 3rd street was going to pair my mid card and give me at best a push, so I raised. Luckily, the other two of that same card followed. You mean a dealt royal without drawing, correct? I've had three of them with the first happening on quarter spin poker. So getting your first one and then having nine at the same time is even more ecstatic!! BTW everybody seems to have heard or seen folks holding a single high card, looking for a pair and ending up with a huge hand. It happens. This screenshot doesn't make sense. A WIN of 2058 quarters on a hand that pays 4000? The first analogy that came to mind is mickey first claiming he'd have jumped on the Ocean Bubbles game in NJ if asked, and then trying to minimize the damage by saying--after the fact of course--that after having some time to go over all this, he wouldn't have because of some 4th line bubble babble. Here's the problem Mr. "greatest AP of all time! "....you've stated time and again how short a fuse this thing had. So in reality per the story you're now making up but just won't stick, you'd have wasted no time getting all over this play if asked, but if you had more time to think about it you'd have stayed put. IE, you'd have lost every dime unless you got lucky. Taken while the credits were still racking up. More ignorant babble from the best of all ignorant babblers. I thought there was more to the play than just 1st and 4th column bubbles. It's turning out to look like there isn't. I have a lot of experience with Ocean Magic. You don't have any. If that's all there is to the play then I'm not in. No one can sucker me into a bad gamble. But others can be. And I think that's what's going on with that play. But you are to stupid and ignorant to know that. OK. It is difficult to reach across from the bleachers , but I understand Rob's comments from the screenshot that was given earlier. I was also confused by the screen shot. Why not wait and post a picture at the end of the payout? Then again, this is why individuals should not make assumptions. As a basketball coach, Rob went for the full court defense and got burned. It happens. Others have done it. The Ocean Magic play is a real deal. Outside of Albany, NY at one venue, the six machines have yielded well. But I am not like most posters, and only go in that area every two months. "Is Rob Singer the new top outlaw? I think so. People should heed his words. He's got the sensible, common sense voice today in VP. How important discipline is. Lucks part in the game. Use of a lower win goal and how important it is to lock it up when it happens. There's more. The bets need to move. There is no longterm. Every day is an independent battle in the present. Smart. Just my take." You know what they say about first impressions, well I am sorry, but, Forrem had it right the first time. BoSox, I have no problem standing with Singer on that one. Pete you are and forever shall be in perfect lockstep with Singer - it is physically impossible for this not to be the case.